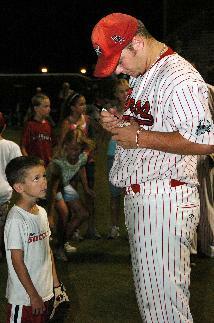 The first CBL Home Run Derby and All-Star Game took place over two days in July, 2007 in League City, Texas. Both events were at Clear Creek High School, which was the final CBL event there as the Bay Area Toros then moved to Texas City to finish out the season. This write up of Noah Scott game from the Archive.org (Wayback Machine) snapshot of the BayAreaToros.com website from November 16, 2007. 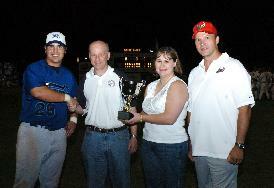 It also includes the 2007 CBL home run derby results. The image of Noah with Ron Baron and Bob Ibach is below in the Images section. Noah Scott, the younger brother of Houston Astros’ outfielder Luke Scott, hit 8 homeruns in the first round, then four in the finals to win the CBL Home Run Derby, in the first day of CBL All-Star Game festivities at Clear Creek Wildcat Field. 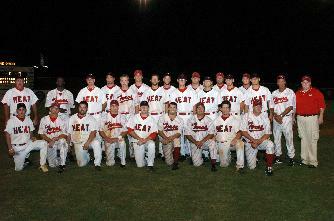 The All-Star Game is Tuesday night at Clear Creek Wildcat Field at 7 PM. Tickets will be available at the gate for just $10. The CBL has announced the Blue Thunder representatives to the league All Star game. In all, the Blue Thunder have 11 players going to Houston for the first CBL All-Star Game. Outfielder Estevan Quintana is replacing Bo Cogbill & closer George Castillo is replacing Eric Diaz on the All-Star roster. There will be All-Star festivities Monday night including a HR Derby & a celebrity softball game. Here are some photos and videos from those two nights. 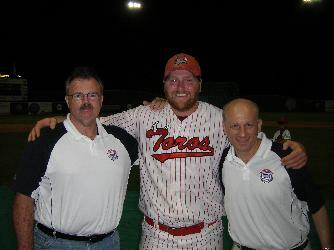 The above 3 photos (Will Smeltzer, CBL 2007 South Team for All-Star Game, and Karl Krailo earning the 2007 CBL All-Star MVP award came from an archive.org snapshot of the 2007 version of the BayAreaToros.com website. No photo credits were given, so if the photographer(s) wish to get credit then simply contact this website and we will give credit for his/her photo(s). Thank you).